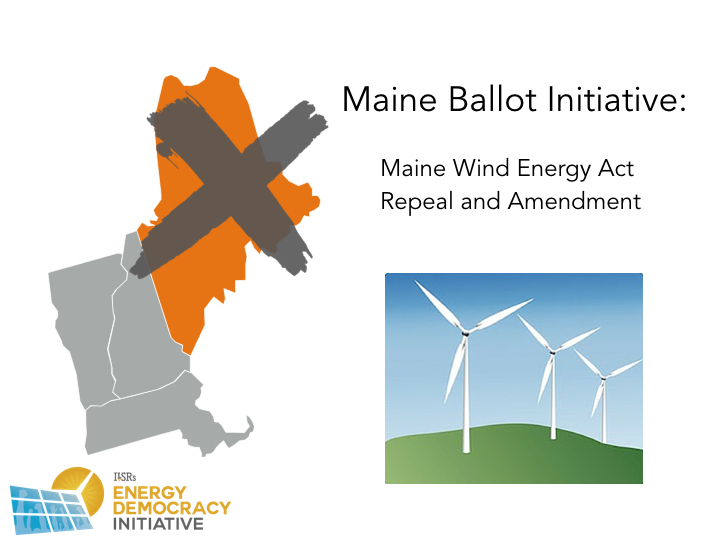 Citizen-sponsored ballot initiatives frequently demand progress on renewable energy implementation (and have for years), oftentimes when state legislatures show little to no political will to increase locally-owned solar or wind energy. In 2016, more states than ever before placed items on their ballots to change the energy landscape. Sponsored by citizen groups, legislators, and (sometimes) energy industry giants, these initiatives range from encouraging energy choice to placing further limits on the propagation of nuclear energy. A number of these efforts, particularly those in Florida and Nevada, are the results of unresponsive legislatures and Public Utilities Commissions (PUC), tied down by powerful utility monopolies (with competing initiatives sponsored by the powerful industry incumbents). The Nevada PUC, for example, completely eliminated net metering benefits for its residents – even refusing to grandfather existing solar projects. This PUC action, at the behest of the utility, Warren Buffet’s NV Energy, motivated citizens of Nevada to propose the Nevada Energy Choice Amendment as well as the Nevada Solar Rate Restoration Referendum. The former would ensure energy market competition and the latter would repeal fixed fees for solar customers (more detail on these and other initiatives is below). 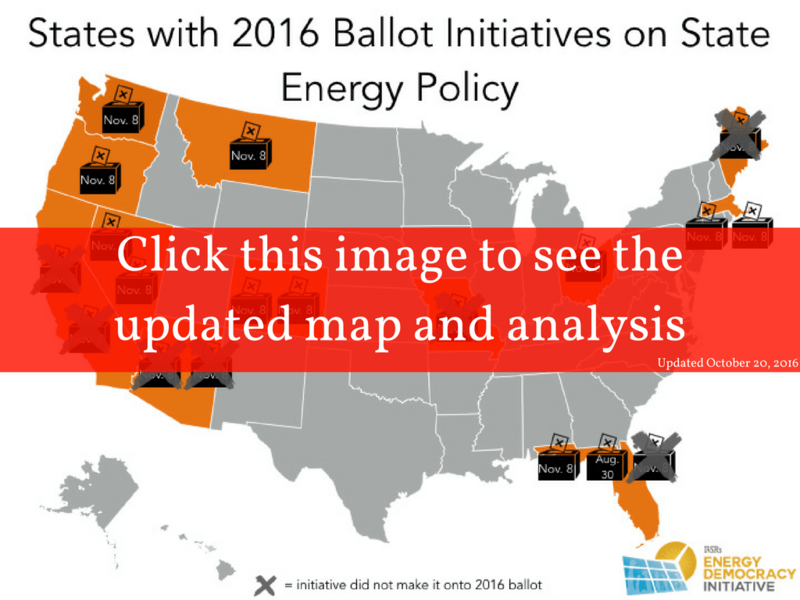 The following map highlights the 12 states with proposed or implemented ballot initiatives in 2016. Many of these initiatives are still collecting signatures to get on the ballot, but they represent efforts of citizens to reclaim control over an energy system long dominated by powerful private interests. The following is a list of the initiatives under consideration, by state. Jump down to Arizona, California, Colorado, Florida, Massachusetts, Missouri, Montana, Nevada, Ohio, Oregon & Washington. The state of Arizona had two proposed initiatives for the 2016 ballot. Both initiatives were withdrawn by their respective parties after an agreement materialized in the Arizona state legislature. Neither initiative seems to be poised for reintroduction in the future. 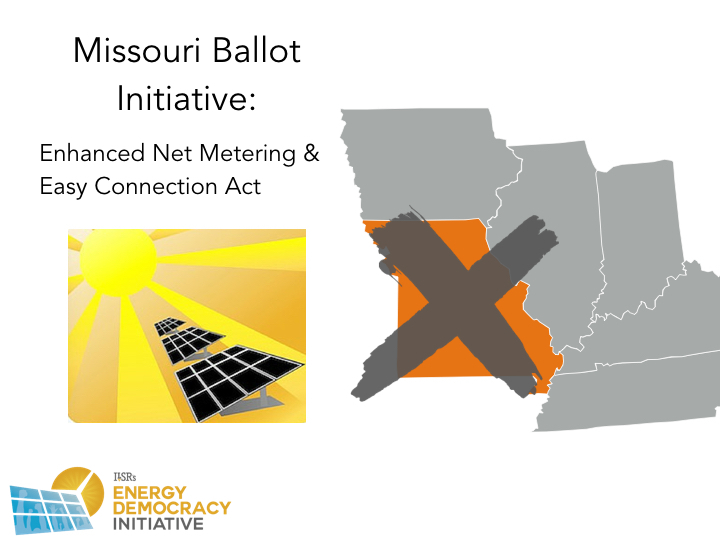 The first proposed initiative would have amended the state constitution to “require energy companies to compensate solar users who generate excess power at the same price that the company charges to its customers,” enshrining net metering in the state constitution. The Solar Energy Industries Association (SEIA) supported this initiative and it was a solar industry-friendly amendment which prompted a response embodied in the Solar for All Act. 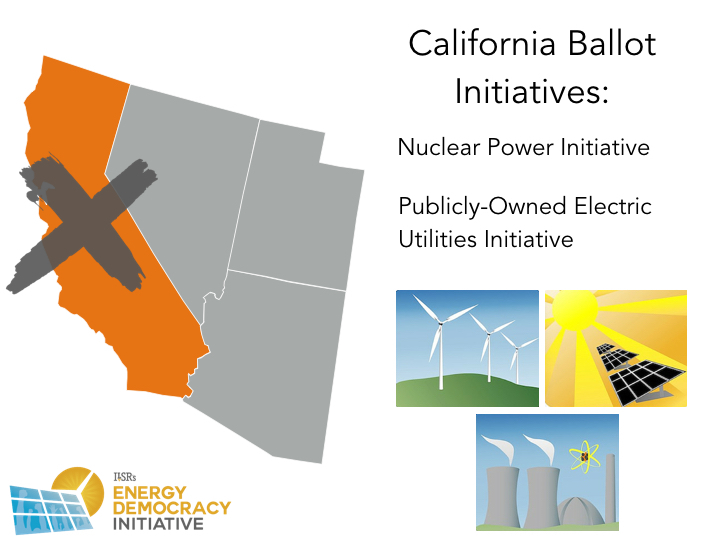 The state of California had two proposed initiatives for the 2016 ballot. Neither initiative gained enough signatures to be considered, but could be considered in the future. With the frequent cost overruns of nuclear power plants, it seems hard to believe that additional regulation would be required to prevent new construction. This initiative may instead be intended to reduce the economic incentive to continue operating the power plants without a plan for disposing of nuclear waste. Since the federal government has been studying this issue for decades with no solution, this initiative may effectively shutter existing nuclear power plants. Municipal utility districts have been at the forefront of clean energy innovation. This includes Denton, TX, with an already 40% renewable energy supply, Georgetown, TX, with its contracts for 100% renewable energy, as well as little Minster, Ohio, with a solar plus storage system. Of course, local ownership is not sufficient to promote clean energy. One of the largest municipal utilities in the country, serving Los Angeles, has been a laggard in developing renewable energy. But local control would give Californians more power to accelerate the transition to cost-effective, renewable energy. The state of Colorado has two initiatives on the ballot during the 2016 voting cycle. The first initiative “authorizes local governments to prohibit, limit, or impose moratoriums on oil and gas development.” The entities can limit this development in order to protect their “community’s health, safety, welfare, and/or environment.” The initiative also protects communities from state preemption of local laws meant to curtail local impacts from oil and gas development. State preemption of local laws, as we’ve written previously, frequently works directly against community’s energy concerns. Protecting local ordinances limiting the development of oil and gas is vital for empowering communities to make their own decisions against dirty energy. 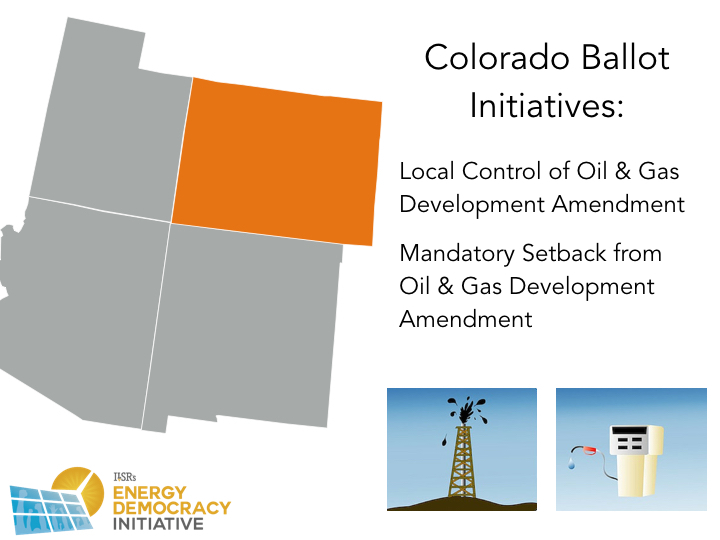 The second initiative would change the Colorado state constitution to require a 2,500-foot setback for any new oil or gas facility from the “nearest occupied structure.” It would, potentially significantly, reduce the ability to extract additional fossil fuels in Colorado. 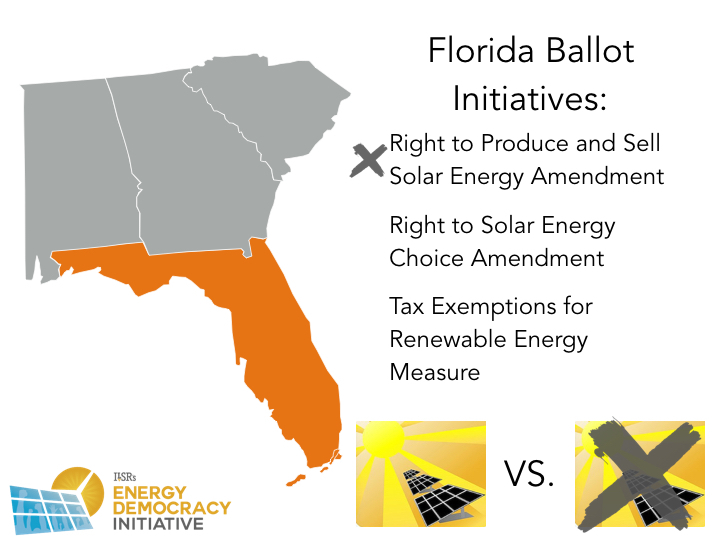 The state of Florida has three proposed initiatives on the ballot in 2016: a utility-sponsored, status quo solar initiative, a citizen initiative shifting the right to produce and sell solar energy, and one renewable energy tax measure on the ballot during the 2016 cycle. The citizen-sponsored initiative did not make the ballot but could be considered in future years. This initiative, intended for the 2016 ballot, won’t be up for a vote until at least 2018. If passed, the ballot measure would provide businesses and individuals a “constitutional right to produce up to two megawatts of solar power and sell that power directly to others,” language designed to allow solar energy companies to build systems on customer property and sell the power directly to via a power purchase agreement. This initiative would overturn Florida’s existing policy of only allowing utilities to sell electricity, no matter the source, directly to consumers. The organization Floridians for Solar Choice led the campaign for the ballot initiative and is a coalition of conservative activists, environmental groups, and politicians of all ideological orientations. The status-quo initiative on the 2016 ballot is a constitutional amendment “giv[ing] residents of Florida the right to own or lease solar energy equipment for personal use.” It offers no new power to customers to procure solar energy through a power purchase agreement and adds new statutory language to allow utilities to attempt to undercut the energy savings from those using solar. The second constitutional amendment on the ballot this year in Florida would “provide tax exemptions for solar power and other renewable energy equipment included in home values for property taxes.” Previous research has shown that residential property values rise about 1% for each kilowatt of solar installed. The tax exemptions would begin 2018 and continue for 20 years. 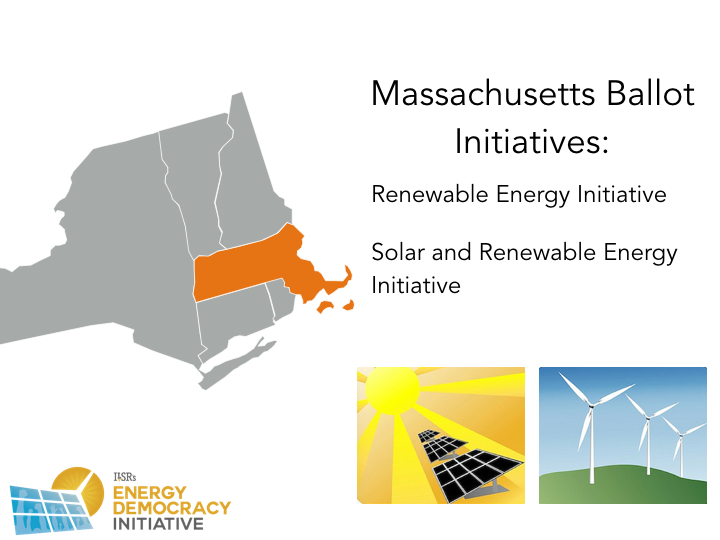 The state of Massachusetts has two energy initiatives on the ballot during the 2016 election cycle. This ballot initiative would require electricity suppliers to increase the minimum electricity generated by renewable energy generating sources by 1% every year until 2019, 2% every year until 2029, and 3% each year starting in 2030. By requiring electricity suppliers to gradually and continually increase their percentage of renewable energy each year, Massachusetts is making a commitment that 70% of the energy load be met with renewable energy by 2040. Removing net metering caps and requiring substantial sales from community-shared solar would dramatically expand solar power capacity in Massachusetts. This initiative did not gain enough signatures to make it onto the 2016 ballot but still could be on the 2017 election ballot. 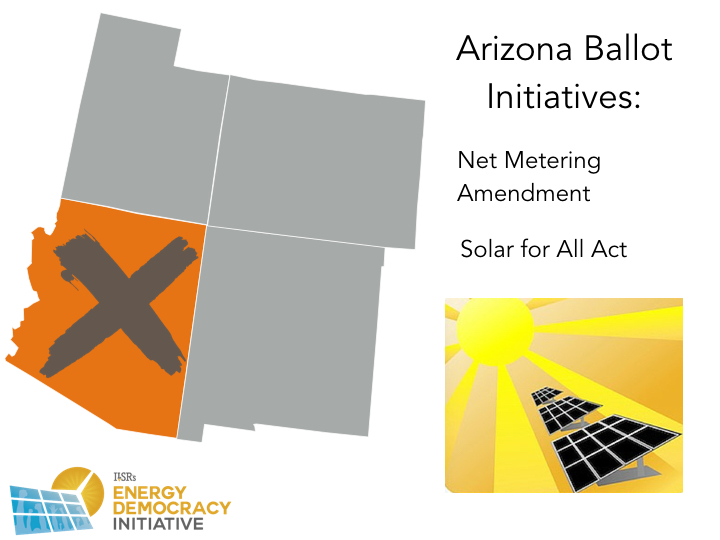 This ballot initiative would require municipal electric utilities and electric corporations to “make net metering available” to a greater number of customers and increase the amount of net metering capacity available to customers. While there are a number of different versions gathering signatures across the state, the features they hold in common is to remove any interconnection fees for customers utilizing net metering, as well as ensuring customer-generators are compensated at a standardized rate across the state. 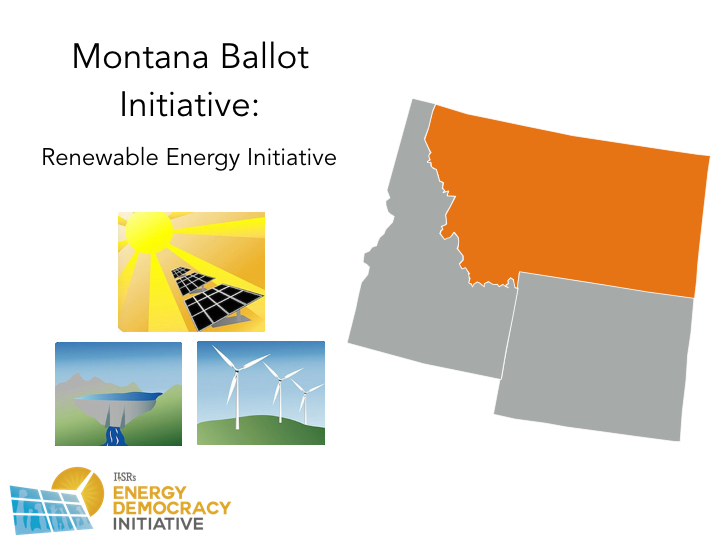 This ballot initiative would require the state of Montana to incrementally supply more of their electricity (80% by 2050) from renewable energy sources, specifically wind, solar, geothermal, and hydroelectric. The measure “would also establish a program for displaced fossil fuel workers and a pension program for fossil fuel workers.” The initiative is important to a state that has yet to establish a renewable energy standard through the legislature. It also caps program costs and provides a safety net for fossil fuel energy workers via retraining programs and pension safety nets, funding with a tax on each kilowatt of electricity produced. These measures are ambitious but “are necessary” to combat CO2 emissions. 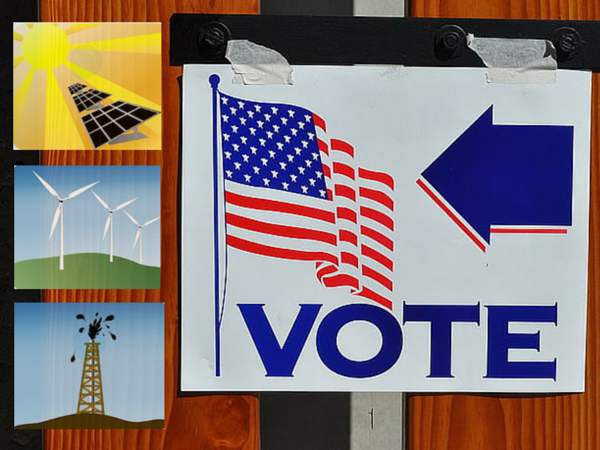 The state of Nevada has two energy related initiatives on the ballot for the 2016 voting cycle. The first ballot initiative would “make it the policy of the state that electricity markets be open and competitive and minimize the regulatory burden in the electric energy market.” The initiative seeks to end the monopoly of utility company NV Energy. 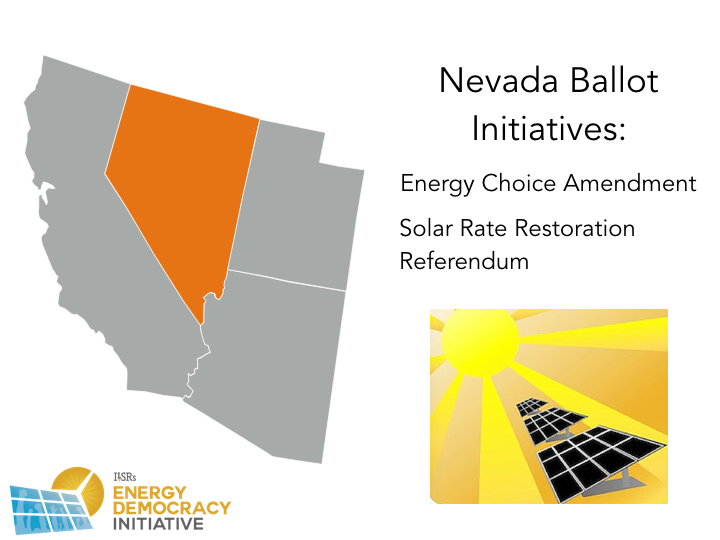 Like the following one, this ballot initiative arose from the controversial end of net metering in the state by NV Energy-backed public utilities commissioners, which led multiple solar development companies, such as SolarCity, to pull out of the state. The initiative’s intention is gain “meaningful choices among different providers” and to minimize the “economic and regulatory burdens…in order to promote competition and choice in the electric energy market.” It’s a direct shot at the monopoly power of NV Energy. The second ballot initiative for Nevada is more typical, targeting a repeal of a section of Senate Bill 374 that “established a fixed fee for solar customers that differed from the fixed fee for other ratepayers.” The initiative would remove the discrimination in pricing on solar customers that reduces the value of the net metering program. As we’ve reported, fixed fees are a way that monopoly electric utilities pass fees onto customers and discourage lower energy use via energy efficiency or on-site power generation. 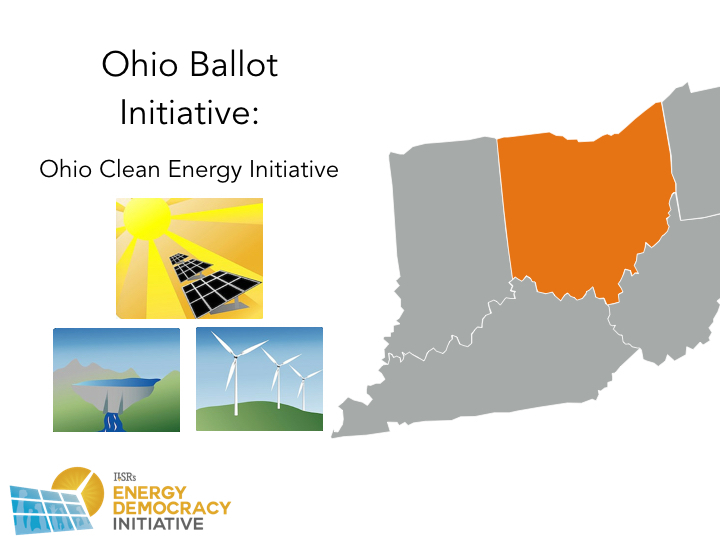 With renewable energy investment stonewalled in the Ohio legislature, this initiative would allow renewable energy projects to move forward in The Buckeye State. 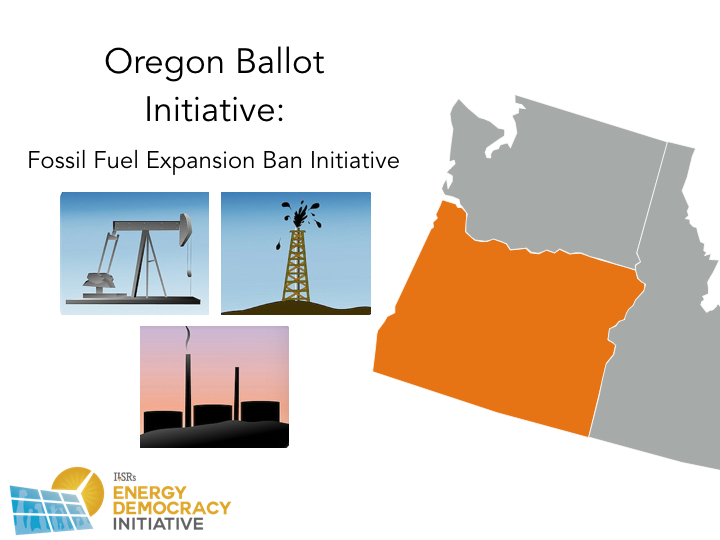 This ballot initiative would “ban the expansion of infrastructure related to fossil fuel extraction, processing, shipment, transportation, or distribution in Oregon.” This initiative has been labeled The Clean Economy Initiative and, while it doesn’t directly expand renewable energy resources, it does shift the impetus towards clean energy development and against fossil fuels. This initiative attacks any expansion of fossil fuel development to the benefit of cleaner energy. 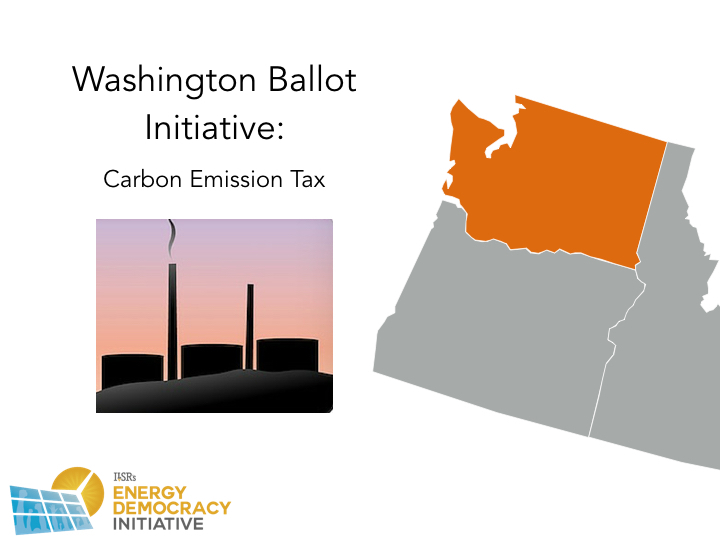 This ballot initiative would impose a tax on “the sale or use of certain fossil fuels and fossil-fuel-generated electricity, at $15 per metric ton of carbon dioxide in 2017, and increasing gradually.” By placing economic incentives to move towards carbon-free and renewable energy, the state of Washington is encouraging further development of renewable energy technology. The organization Carbon Washington sponsored this initiative. 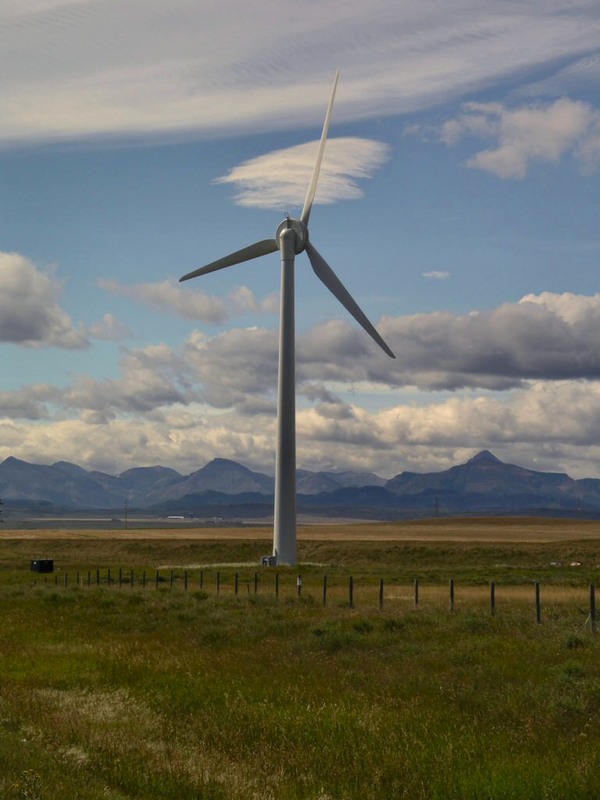 Editor’s Note: The Alliance for Jobs and Clean Energy of Washington state was originally reported as being in favor of the Carbon Emission Tax, this was in error and that section has been changed to reflect it.